PUCHONG: Continuous heavy rain at Pusat Bandar Puchong has resulted in flash floods with water levels rising to as high as 1.5 metres. 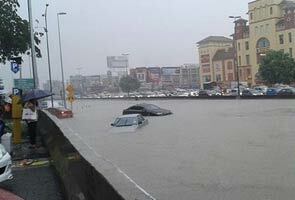 The flood, which has affected areas from Jusco IOI mall to Bandar Puteri, has subsequently caused massive traffic jams in the area. According to operations supervisor Senior Fire Officer 2 Pusat Bandar Puchong, Ashwan Wasir, the heavy rain started at about 5pm with reports regarding the flooding being received as early as half an hour later. "The flood happened because the drainage system could not handle the large amount of water during the heavy rain," he said. Ashwan said a bus, two lorries and two cars were badly damaged after they were trapped in the flood. However, he said the water started to recede after an hour. Meanwhile, road users who were caught in the traffic had also tweeted about the flood.